The number of ribs in a rack seems to vary from store to store. Some restaurants and stores serve as little as five ribs per rack while others serve up to 13 ribs per rack which is a growing concern for people who are frequent customers. This concern leaves many customers wondering "How many ribs in a rack?" This article will help you know what to expect the next time you buy a rack of ribs. There are different kinds of ribs depending on the animal you use as the source. The most common are beef, pork and lamb ribs. Each type of rib﻿s has a different number of ribs on a rack. My all-time favorite is pork ribs. These are very popular and are what come to mind when most people think of ribs. They are fatty making basting quite comfortable when making a barbecue. Instead of eating them at a restaurant, you can quickly cook them in the comfort of your home. If you do decide to cook your ribs at home, you should use a burner grill like th﻿﻿i﻿﻿s one. Also, do not forget to get skewers like these. There are several cuts of pork ribs in the market today. Here are a few. Although their name might suggest so, they are not the ribs of a baby pig. They are also known as back ribs, pork loin ribs or loin ribs. attached here and are therefore removed. They are shaped like the end of a hockey stick, tapering out where the loin meat was attached. Baby back ribs are meaty and tender making them well liked. In the past, they were only referred to as "baby back ribs" when the rack was less than a pound and a half in weight. These days the weight does not matter. In the past, most people liked loin meat more than baby back ribs, so butchers tended to leave some loin meat on the ribs to increase its popularity. Leaving the loin meat paid off and led to some people referring to loin meat as boneless baby back ribs. These ribs come from the ends of baby back ribs up to the breast of the pig. They tend to be larger but tougher and harder to cook. They are also known as side ribs or spares. These ribs tend to have less meat than the baby back ribs. These are similar to the spare ribs. The only difference is that in this ﻿﻿cut the breast bone and cartilage is removed to make a rectangular shape. They are also known as breastbone-off spare ribs. They tend to be meatier than their spare ribs counterparts. These are the excess meat and cartilage cut from the spare ribs. These ribs also have a large fan base and come in different cuts. Beef tends to have less fat when compared to pork, so it falls upon the cook to make sure it's moist enough. These come from the brisket and chuck area of the cattle. They are usually very meaty and full of flavor. They should be cooked slowly and for long. Contrary to popular opinion, they are not called "short ribs" because they are short. In fact, they come in all sizes. Their name is derived from the fact that they are cut from the short plate section of the cow. Short ribs can be cut parallel to the bone which is known as English style or against the bone which is known as Flanken-style. These are cut from the prime rib. They are also known as the Texas rib or the Spare rib. They are tender and can even be cooked on a stove top. These are a delicacy especially for people who prefer lamb to beef or pork. They are however not as common as beef and pork ribs. If you have trouble finding good lamb ribs in a restaurant, you can make some at home. This video gives a step by step guide on how to make delicious lamb ribs. A rack of baby back pork ribs usually contains 10 to 13 ribs. It is the approved number. Anything lower than ten ribs might be due to the trimming of the meat which could be caused by damage. These bones are usually between 3 to 6 inches long. A rack of spare ribs usually contains 11 to 13 ribs. 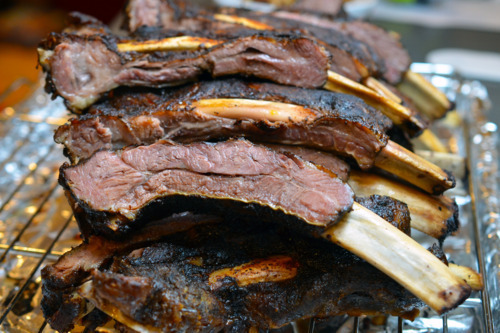 A rack of lamb ribs is considered to be eight ribs. In cases that they are 7, this can be due to trimming. Any number below this is unacceptable and frankly heartbreaking. According to the United States Department of Agriculture (USDA), a rack of beef ribs should be at least 11 ribs. It can contain up to 13 ribs, but they can be less due to trimming. Beef side ribs are 3 to 4 inches while the back ribs are 6 to 8 inches long. Now that you are informed about the different types and cuts of ribs and their number in a rack, you will find it easier to choose restaurants to eat in. You will also be able to tell if someone accidentally serves you half a rack.